This is a freeware first person adventure game. In it you must rid a manor of seven monsters who inhabit the mansion such as a headless horseman, an invisible man, and a zombie. 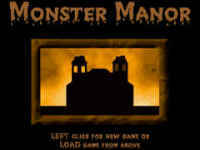 This is done in an traditional adventure with the use of items you collect while exploring the manor.